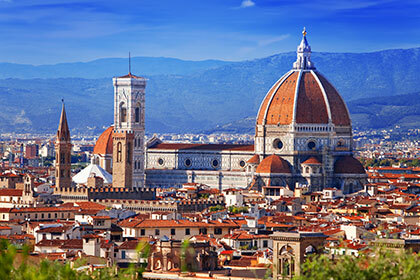 Florence is well-connected with the rest of Italy and with Europe, and is easy to get to by air or land. In the last few years there has been a significant increase in traffic in and out of Florence’s Vespucci Airport, and the infrastructure and facilities are constantly being upgraded. The Florence airport (FLR) is called Amerigo Vespucci and is situated on the north-west outskirts of Florence, just 4 km from the city center. The airport can be reached from the center of Florence, driving the whole length of Viale Guidoni up to the road leading to the “Firenze Nord/Firenze Mare” superhighway (A1 and A11). The center can be reached in about 15 minutes by taxi, and in about 20 minutes with the Bus italia SITA Nord “Vola in Bus” bus shuttle operating between the airport and the central railway station of Santa Maria Novella. The Florence Airport is connected to some of Europe’s major airports such as Amsterdam, Barcelona, Brussels, Bucharest, Frankfurt, Geneva, London Gatwick, Madrid, Munich, Paris Charles de Gaulle and Vienna. There are also flights to and from the following Italian cities: Bologna, Cagliari, Catania, Milan Malpensa, Olbia, Palermo, Rome Fiumicino, Turin and Verona. From the Florence airport, you can get to downtown Florence either with a taxi or with the special “Vola in Bus” bus shuttle (run by BusItalia Sita Nord now) that you can take from the airport to the central Santa Maria Novella train station (SMN). It takes about 20 minutes, sometimes a little more if there is heavy traffic. The service runs daily, including Sundays and holidays. Departures from the airport are every 30 min between 5.30 am to 8.30 pm, and every hour until 11.45 pm. The last shuttle is at 1am, but at this hour, it will be more convenient to take a taxi. Departures from the city center (SMN train station) are every 30 min between 5.00 am to 8.00 pm, and every hour up until 11.00 pm. The last shuttle is at 12:30am. A one-way ticket costs 6 euros while a round trip ticket costs 10 euros. Tickets can be purchased directly on board from the driver at no extra charge (but keep in mind they only sell one-way tickets on board). The round trip tickets have to be purchased before getting on the bus, at the Busitalia SITA bus station off SMN or at ATAF&Li-nea resellers (most newsagents sell ATAF tickets as well as many coffee “bar” shops).